Early this morning I pulled some weeds in the garden and checked on the Spaghetti Squash and found this great big one. It is a nice buttery color and was the first one I harvested. I laid it in a plate to give you an idea of it's size. This is not one of the two Squash that I had photographed earlier in the month. Those smaller ones still aren't ready to harvest until they turn a more buttery color. I must admit, I am a little excited about the Spaghetti Squash. I plan to bake it. Once cooked, you use a fork to shred the insides, which gives it it's name and the appearance of spaghetti. I noticed the Internet is not lacking in recipes for the Spaghetti Squash! I took this picture above early this morning, while the weather was very cool and the sunflowers on this one plant (yes, this is really just one plant) are still pretty. This is another Sunflower that was not planted, but a seed had been carried by the wind and it grew where it landed. I don't know what variety of Sunflower this is, but it is about twelve feet tall and loaded with blooms! It almost reminds me of a tree that would have bloom at the end of each branch. And this is just a view of the top half of it. 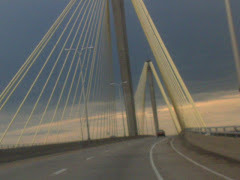 Here's a different view of it taken this evening. The wind has blown it constantly and it leans over. Again, this is just the top half of the plant. Right now I'm so proud of my beautiful Passiflora edulis, commonly known as the Passion Fruit or Passion flowering vine. This is my third year growing it and as you can see, it is now bearing fruit for the first time. It also quickly overwhelmed the trellis, so Ron built an extended trellis nearly ten feet tall. Nothing fancy--It's just a tall post with some wire fencing attached. It will be covered in foliage, flowers, and fruit in a few weeks though . I will take a picture of it later on, when the tall trellis is covered. The picture above shows one of the many Passion fruits still on the vine. The are the same color as a lime and about the same size. They are loaded with seeds, much like a pomegranate. I was up early this morning in the garden and noticed the Passion fruit on my way back in the house. I am so thankful to my friend Randy, who gave me the plant, when it was just a seedling three years ago. Thanks Randy! Back in February I did a blog post with some pictures of last years beautiful blooms. It was cold and dreary at that time and "passion" was part of the LOVE theme of Valentine's week. This picture is my favorite and also is wall paper on my computer. The blooms are so pretty and plentiful, but they are not very large--only about 3-4" in diameter. A few weeks ago when I made my previous post of soybean fields surrounding the farm, the bean pods had not yet formed. The bean fields are really tall right now and are loaded with soybeans. I took this photo a couple of weeks ago and now you can see the fuzzy pods have formed. I have no idea when the beans will be harvested, but probably sometime in September. The bean fields are still very beautiful, as you can imagine. Click on the play button of this cool widget and hear her new music right now! Whitney Houston's long awaited album, 'I Look to You' is being released Monday, August 31, 2009! I can't wait. I have always been a big fan of her music and that's what it's all about--music. As I said, I am a big fan, but I know everyone isn't. I hope to see some positive comments, but I can take whatever you've got to say--good or bad. Believe me, I doubt that any comment you leave would be something I haven't already read on the Internet! We all know she has been down a bad road, but let me be the first to say she ain't dead yet! I have read many reviews of the new album and some are down right mean. For the most part though, the album is being very well received and there's already talks of Grammy nominations. This has been a difficult post to make. I had many reviews and video clips bookmarked, but they have been either taken down or the videos can no longer be embedded. So, I had to start from scratch! I would've liked to have made this sooner! You can expect heavy promotion with this cd! Whitney invites you to her free GMA concert on September 1, 2009! It's never too early to set your vcr, dvr or Tivo for Good Morning America on ABC for that date! 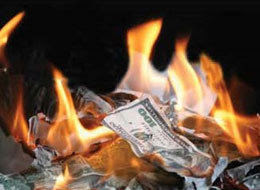 You may have also heard a dirty rumor that Walmart would not be selling the cd! Many people believe it was true, because Miley Cyrus has a cd being released the same day (available only at Walmart) and Miley the Pole Dancer has joined forces with Walmart with her clothing line (how appropriate for young teen girls). Anyway, back to the rumor, Whitney has an official statement about this on her website. Whitney's new album will be sold in Walmart stores. Here is one of my favorite reviews: Whitney Houston makes a million dollar album. I always love to read Pop and Hiss at the LA Times Music Blog. The other day it had a thorough review of each song, and that has since been taken down! Here is the "revised" review of 'I Look to You' by Whitney Houston. This is a great review and full of lots of history and lots of readers' comments worth reading. Like the man (almost) sang: Everybody must get snow. Bob Dylan plans to release a collection of familiar yuletide tunes, to be called “Christmas in the Heart,” with proceeds of the album to benefit hunger-relief charities, he announced on his Web site, bobdylan.com. (Click the shared link above for the full article). While it's certainly a well intentioned effort, have you you heard him sing lately? Here's how he sounded live last summer in Madrid singing what he sings best. Now listen to the music in the next video. Can you understand any of what he is singing?! This is the all new version of Bob Dylan's Dignity, from Hannover, Germany AWD-Hall, from March 31, 2009.
first line is: (can't you tell)?! Since it's for charity, I wish him much luck with the album. Enough said! Is it a chicken bun or a bun chicken? Whatever! 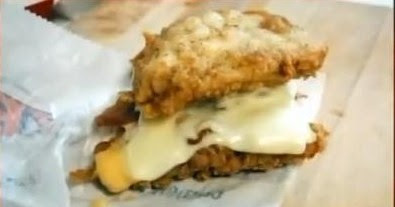 It comes with two slices of bacon, Pepperjack and Swiss cheese and the Colonel's "secret sauce" between two filets of KFC breaded chicken. Sorry to be such a tease, since this sandwich is only being test-marketed in Rhode Island and Nebraska right now. I wonder how much saturated fat and cholesterol it contains? Would you try it? Here's another article about the new sandwich, and it includes a video of the tv commercial. Doesn't this look delicious? Mmmm, wouldn't you just love one of these with your coffee? How about some fresh strawberries with this tasty treat? This was in a Walmart bakery package of six. I tend to avoid processed foods like this, and when my partner came home with these treats I didn't give it much thought. I knew I wouldn't be tempted to eat it, and after about a month I noticed there was still one left. It still looked fresh and had been sitting on the counter wrapped in saran wrap. That was in March. At that point I asked him if he was going to throw it out or was it a science project. I just took these pictures the other day. In the first picture I removed the saran wrap to show how fresh it still looks. I wrapped it back up in the clear saran wrap for the second picture and put it back on the counter. I don't know why it was never thrown out, but now it has indeed turned into a science project. How long until it starts to mold? Why hasn't it changed at all yet? Is it full of preservatives? How long until somebody unknowingly picks it up and takes a bite? Will they get sick? Those lyrics, "Hotel, Motel, Holiday Inn" can again be heard in the hit song "Hotel Room Service" from the NEW Pitbull album. "Rebelution" will be released on Monday, August 31, 2009. If you listened to any radio lately, then you've surely heard the song "Hotel Room Service." At least two other songs from this cd have already been released too, including "Krazy" and "I Know You Want Me." It was 30 years ago when we first heard the lyrics "Hotel, Motel, Holiday Inn." If you were around back then, do you remember which song had those lyrics? If you are too young to remember, then you can hear those lyrics in the second video below. For those who of you into music trivia, I will try and have a bit of space between the videos. That way you can guess first and then scroll down to see if you were correct. 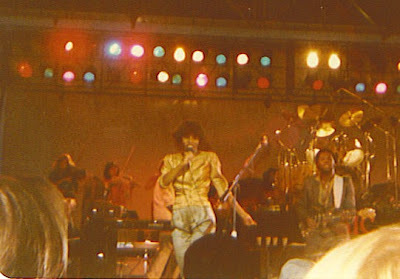 Here's the music trivia question: What 1979 hit song mentioned the lyrics, "Hotel, Motel, Holiday Inn, and who sang it?" And here is a little filler text to separate the two videos. Hopefully, you cannot see the answer (which is the video below) until you scroll down. Make your guess now! The 2009 album from the Latin Hip Hopper. Pitbull is a Miami rapper who has been an independent artist and now signed to a major label. His 2004 debut album M.I.A.M.I. (Money Is A Major Issue) featured the hit single 'Culo' and became the biggest selling bilingual debut since Cypress Hill's self titled debut in 1991. With five subsequent chart-topping albums and a multitude of hit singles, including 'The Anthem' and 'Krazy', Pitbull continues to blaze trails and maintain his status as the #1 Latin artist on Myspace and beyond. So, do you think you know the correct answer to the music trivia question? Here's some clues. It was a 1979 hit single by an American hip hop trio. While it was not the first hip hop single, it is generally considered to be the song that first popularized hip hop in the United States and around the world! The song is ranked #248 on the Rolling Stone magazine's list of The 500 Greatest Songs of All Time. In late 1979, Debbie Harry suggested that Nile Rodgers join her and Chris Stein at a hip hop event, which at the time was a communal space taken over by young kids and teenagers with boom box stereos, which would play various pieces of music that performers would break dance to. 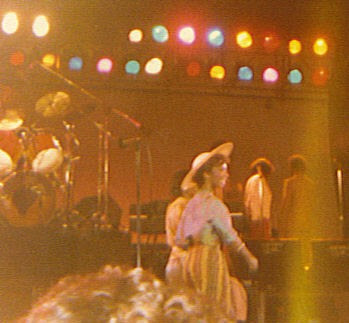 The main piece of music they would use was the break section of Chic's "Good Times," which Harry wanted Rodgers to appreciate. Rodgers experienced this even the first time himself at a high school in the Bronx. (Wikipedia) Click to read the full story, but not before you guess! Scroll down slowly as you think about the trivia question. surely you know the answer! And here is the answer to the trivia question "What 1979 hit song mentioned the lyrics, "Hotel, Motel, Holiday Inn, and who sang it?" If you guessed The Sugar Hill Gang's "Rapper's Delight," then you are correct! This blog post is a lead in to my next post! 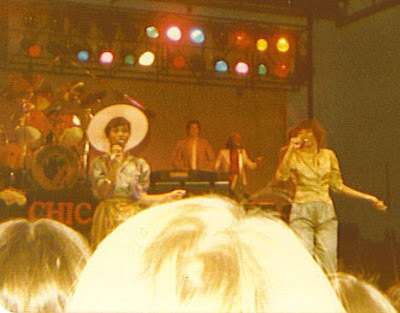 While I was composing the next post, I realized that I had several old pictures that I took at the Chic concert that Lisa and I went to at the Illinois State Fair in August of 1979. 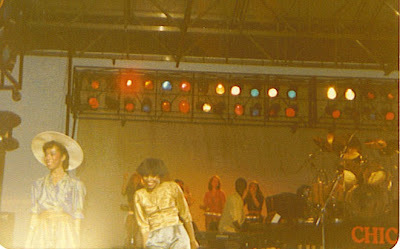 Out of all the times I went to the fair, the most memorable of my "Good Times" was at the Chic concert. Here is an extended version of "Good Times," in case you want to hear it. I think it is one of the greatest pop songs of all time. I hope you enjoy it! The following information is from Wikipedia, but don't click any of the links yet, because a trivia question is coming up! Chic (pronounced /ˈʃiːk/ "sheek", sometimes fully capitalized as CHIC) is an American disco and R&B band that was formed in 1976 by guitarist Nile Rodgers and bassist Bernard Edwards. It is best-known for its commercially successful disco songs, including "Dance, Dance, Dance (Yowsah, Yowsah, Yowsah)" (1977), "Everybody Dance" (1977), "Le Freak" (1978), "I Want Your Love" (1978), "Good Times" (1979), and "My Forbidden Lover" (1979). 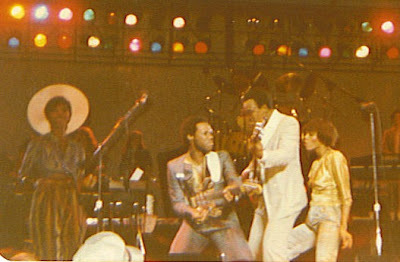 Chic has recently been nominated for possible 2009 induction into the Rock and Roll Hall of Fame. (from Wikipedia, but don't click these links yet, because a trivia question is coming up)! Wikipedia has a lot more information about Chic. 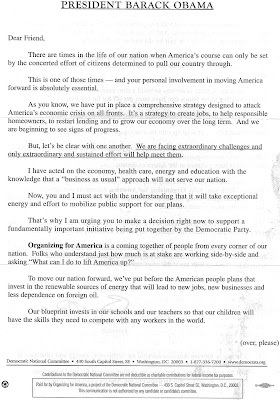 You may have to hit Ctrl + a couple of times to enlarge the text to read the letter above. 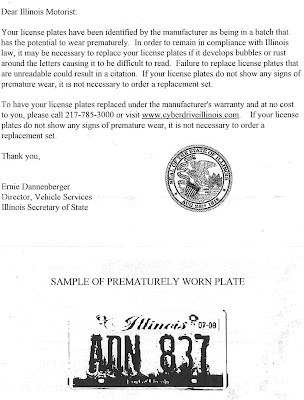 This is the SECOND time I have received this fancy piece of mail from the state of Illinois. You know the kind that has no envelope and you must fold on the perforated lines on each side and top, tear them off and wallah you have a letter with no envelope. This is just another example of why our state is broke...sending out this crap! I wonder how many more times they will send it? If they know my plates are defective and the manufacturer will replace them, then send the d*mn plates already and stop wasting money on mailings! This has got to be the dumbest piece of mail I have ever received from the state! 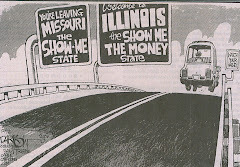 According to an article in yesterday's Illinois Times, the state of Illinois budget deficit tops 10 billion dollars! 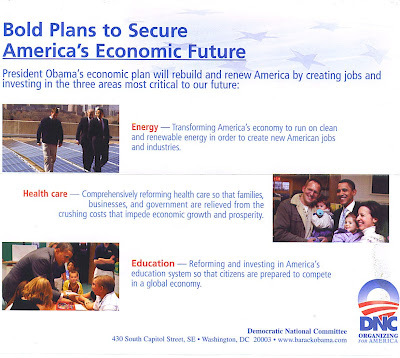 For the state to be spending money on these multiple mailings, while the deficit soars is just irresponsible. 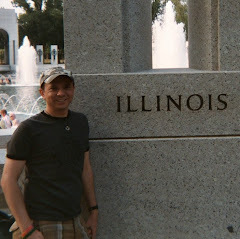 Election day can't come soon enough for this state! Here is another short sneak peak of this season's Project Runway, but I really just wanted to also say that Lifetime is running a two hour special tonight before Project Runway. "Project Runway: All Star Challenge," about eight former fan favorites and "Project Runway" superstars return to the catwalk to compete against one another. It's on a different channel (Lifetime) and in a different city (Los Angeles), but everything else is about the same. It's sure to keep us on pins and needles, so now is the time to set your vcr, dvr, or Tivo! Project Runway season six premieres Thursday, August 20, 2009 at 10:00 p.m. eastern/9:00 p.m. central on Lifetime, and the new show "Models of the Runway" premieres right after Project Runway. I predict that both of these shows will be the most popular shows on Lifetime (well duh, it's Lifetime channel)! Kelly Osbourne, Mya, Macy Gray, Donny Osmond, Debi Mazar, Melissa Joan Hart, Ashley Hamilton, Joanna Krupa, Tom DeLay, Natalie Coughlin, Michael Irvin, Louie Vitop, Chuck Liddell, Aaron Carter, Kathy Ireland, Mark Dacascos. Sometimes the vines grow close and intertwine, as in this case of two small watermelons on the left and Spaghetti Squash on the right. The Squash is nearly ready to harvest, and I can't wait to eat some! This is one of the ornamental "bumpy" gourds. It's good for nothing but Fall decorations! The watermelons are coming along nicely. This photo shows three different sizes from that of about the size of a cherry tomato, to a melon the size of a softball, to the largest one--almost as big as basketball. Here's three more assorted sizes. I'm not sure if they are on the same vine or not. This large one is almost, but not quite as large as the one in the first picture. It was getting close to dark, so this little melon has a flash of light on it. It is a beautiful color of green like a lime. They will taste completely opposite of a lime, of course and be super sweet! Mmmmm! Can't wait.